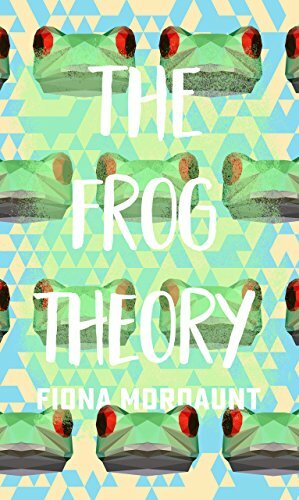 THANK YOU RACHEL FOR INVITING ME TO TAKE PART ON THE BLOG TOUR FOR THE FROG THEORY by FIONA MORDAUNT. Tragedy and comedy in perfect proportion. Kim and Flow are the best of friends, living on a council estate, making money selling drugs. Just around the corner in a smarter part of Fulham is Clea, a well-heeled young woman coping with a violent home life at the hands of her twisted step-father. The Principal runs a famous college for problem teens. Fostering guilty secrets which distance her from her own children, she resists the advances of a man she sees on the train every day. When Kim and Clea meet by chance, Kim is smitten but worried about her. Using the anecdote of the frog theory – that it will jump straight out of boiling water and live, but stay in and die if heated slowly from cold – he wakes her up to the dangerous situation she’s in at home. Serendipity and a cake-fuelled food fight that goes viral will bring Kim, Clea, Flow and The Principal together in weird and wonderful ways in this frenetic, laugh-out-loud story about love, conscience and lion-hearted nerve. When I began to read this book I thought that it would probably be more suited to a younger woman than myself but no matter what era you are born in there will always be the loud mouth, the show off, the rebel the romantic and worst of all the arse hole (there are a couple of them in this story). Somethings never change. As I read I could have easily renamed all of the characters to the people I remembered from my school days and so my mind created their images to play the roles in the story. The author Fiona Mordaunt portrays the street wise lads as being loyal to each other with the unwritten rule of don’t mess with my girl. The girls on the other hand seem to play what you don’t know won’t hurt you rule, with a determination to bag the first lad that is willing to shack up with them. It has always been the same crowd all from the same sort of background right way through school until one day things change. Fate throws into the mix a young lady, yes lady from the other side of town, who’s step father drives a Porsche. But just because the outside world thinks she is living the dream doesn’t change the fact that she is actually in a nightmare situation at home. One of abuse. When Clea tells one of the lads Kim about her situation he tells her a story about a frog. He says if you drop a frog into boiling water it will jump out but if it is in cold water that is heated it will stay there not realising and eventually die. Clea knows that only she can change her life. This is such a great story of love, loyalty, misunderstandings and coming of age type books. It follows the main characters Kim, Flow and Clea from the teenage years to adults. There are lovely romantic moments, times when I was going, ‘tell her for crying out loud’ and very funny times. For me it was one heck of an all round entertaining read. I particularly loved the times with the Principal. Classic. After attending school for model-making, Mordaunt started Image Casting in 1998, specialising in customised body castings. Over the course of 13 years, she worked on such films as Atonement and The Wildest Dream, as well as for personal clients like Lionel Richie. In 2012, she relocated to Botswana with her husband and daughter where she currently resides.